Crunchy, chewy, and chockful of oats and seeds, these fun little nuggets are super easy to make and great for snacking. Oats are combined with raisins and raw sunflower seeds and pepitas (pumpkin seeds). What holds these little balls together is a mixture of almond butter, honey, and brown rice syrup (barley malt syrup was suggested for the recipe...but I certainly was not going to drive all over town for something so obscure). The honey is an excellent sweetener, giving an almost floral kind of flavor, and cinnamon provides a wonderful fragrant spice. These were almost like eating little healthy protein bar bites. One ball (which were about 1-1 1/2 inches each) is the perfect amount for snacking, and two or three of them would be the perfect amount for a nice hold-me-over until lunchtime or a pre-workout snack. The recipe suggests they remain refrigerated, so I'm not sure how well they would hold together at room temperature. But even cold, these were delicious to eat. 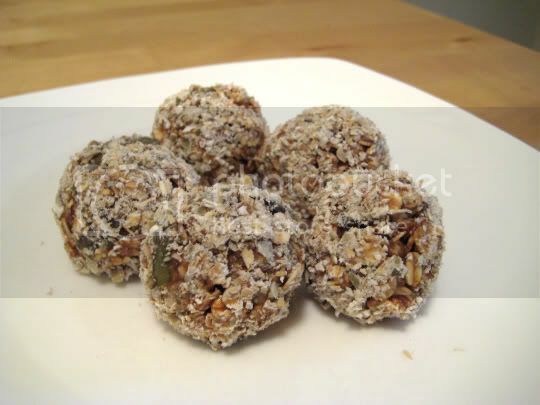 Although they were easy to make, forming the balls and then rolling them in ground oats and pepitas got a little messy. It is VERY important that you keep your hands wet when rolling the mixture into balls, or you will get almond-butter-and-honey-coated hands. Make again? Definitely. Great for snacking, and high in protein and fiber!